Winning the Super Bowl wasn’t enough. A four-year contract for $30 million also wasn’t enough. He is one of the NFL’s top running backs – and at the brink of preseason football the Seattle Seahawks' Marshawn Lynch decided he was underpaid. Yes, you heard me -- $7.5 million a year wasn’t enough for Lynch. Luckily, for Lynch and the team, the powers that be were able to “move around” some money to guarantee Lynch $1 million in incentives and roster bonuses. Not too shabby for throwing a workplace temper tantrum. I would say 99 percent of us would never get the same results as Lynch if we refused to work until we got a raise. In fact, I would bet most of us would get fired. So my weekly words of wisdom: Don’t pull a Lynch if you feel your are underpaid. Regardless of whether we all think Lynch was overcompensated, compensated fairly, or underpaid, most of us are in the same boat as Lynch and wonder if we are being compensated what we are worth. According to Glassdoor.com, a recruiting Web site, 39 percent of employees feel they are not being compensated fairly for what they are asked to do. In an ideal world, we would all like to think we are all equal and should be compensated equally as well. The fact is, when it comes to the workplace we are not all created equal and therefore are not paid equally. Employers have a number of factors to consider with each employee’s individual pay, including education, experience, productivity, performance, responsibility levels and specialized training and knowledge. These factors are typically combined with the “market rate” for a particular position (or similar positions) in a job market. Being underpaid is probably one of the worst feelings in the world. What could make you feel worse or more worthless than not getting fair market rate for what you spend the majority of your life doing? If an employee does feel underpaid, it can create a lot of problems sure to impact the business, including lower productivity (why work hard if it doesn’t matter in the end? ), high turnover, absenteeism and decreased morale. Aside from asking co-workers what they make – not a great idea and forbidden by a lot of employers -- how can you tell you may not be getting what you're worth? A great place to start is online salary surveys. The Internet has resources literally at your fingertips to help you determine the overall basis for what the “market rate” is for your position. Great sites to start with would be the U.S. Department of Labor and recruiting sites like Glassdoor.com or Careerbuilder.com. Also, visiting with others in your industry in similar positions is a good way to gauge where your compensation sits within the market. Next, it is good to take a look at the company performance overall. If profits and revenues are growing and your salary is staying the same over an extended period of time, it may be time to have a visit with the boss. While a strong overall company performance without raises doesn’t exactly confirm you are underpaid, it still is something to explore if you are questioning fair compensation. If your responsibilities have grown, but your paycheck hasn’t this also could be an indicator you are underpaid. Keep in mind however that many employers will assign expanded duties to employees who are productive. While expanded duties may not equal an expanded paycheck – and could be an indicator you are underpaid – it is good to keep in mind that expanded skill sets look good on resumes for future opportunities. If you still have gone through all of these steps and feel like you are underpaid there is nothing wrong with sitting down with your manager or supervisor to discuss your compensation concerns. Recently, I have seen that most employers do not automatically or consistently hand out raises, but rely instead on employees asking for raises. In today's workplace, you will more than likely be the party to begin the discussions. If you decide to ask for a raise, stick to presenting facts about your responsibilities and your accomplishments and how they relate to the company. Discussing personal financial needs or overall economic conditions usually deters employers from giving raises. In the end if you do feel you are being underpaid and your employer is not willing to work with you, the job market is back up and booming – so it may be a good time to take a peek at what else is out there. 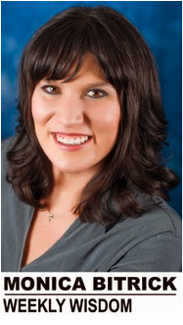 Monica Bitrick is CEO of Bitrick Consulting Group, a human resources company in Idaho Falls. If you agreed to work for a particular wage then you are fairly paid! If your mom accepted the job for you, you should move out of the basement. Hello there, I do believe your blog may be having browser compatibility issues. Whenever I take a look at your blog in Safari, it looks fine but when opening in Internet Explorer, it's got some overlapping issues. I merely wanted to give you a quick heads up! Aside from that, fantastic blog!